This post is not about answering said question, because it’s a ridiculous one. 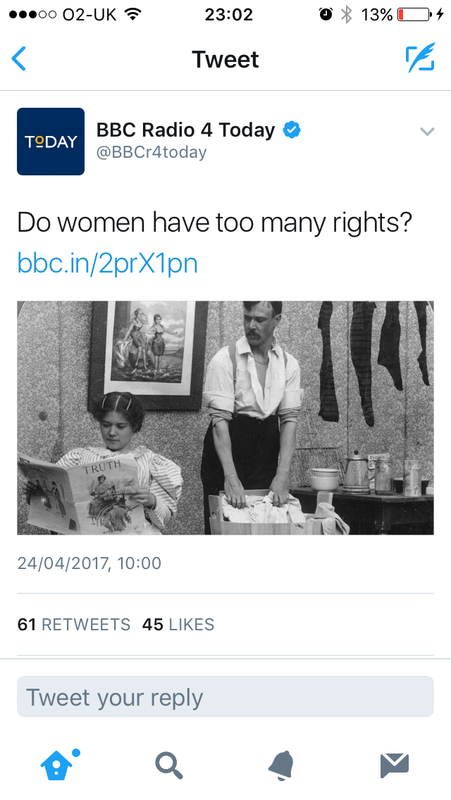 Do women have too many rights in comparison to what? Bees? Vampires? Mermen? What could possibly constitute ‘too many rights’? Have women been given the ‘right’ to freely murder your hamster if they don’t like the cut of its gib? Of course not, they’d be given a stern telling off for such behaviour, just like any man who did the same. ‘Rights’ in this context refers to ‘that which is due to anyone by just claim, legal guarantees, moral principles, etc’. Hamster killers don’t hold the moral high ground over anyone. Anyhoo, I digress. On a first reading that tweet, which is from the verified Twitter account of the Today Programme – which self identifies as “Radio 4’s flagship news and current affairs programme” – it seems like they might endorse this nonsense view. When challenged, they explained that actually it’s a quote from one of their interviewees, Philip Davies MP. SO WHY DIDN’T THEY USE QUOTATION MARKS? My feeling is, this tweet did not appear impartial, and the claim is not factual or current. However, I have seen a few different interpretations. Some have suggested it was meant to be sarcastic, and that if you know the tone of the Today Programme this would be clear. To those people I say, this is NOT CLEAR. People who don’t listen to the show don’t have that context. Twitter reckons it has about 313 million active users per month world wide. Sorry, but we just can’t assume they all listen to Radio 4. However, tweets like this one occasionally go viral, and are seen by far more people than will tune in. So based on this context-less tweet, their ‘understanding of all parts of the United Kingdom’ is that we’re looking to what? Go back to a point in time (only 40 years ago) when women couldn’t buy a washing machine without a signature from their husband? All the majority of users have to go on is this bare bones clickbait headline. We scroll past thousands of other such comments on a daily basis. So one has to wonder whether this was a rather cynical move to drive engagement with the Twitter page. It probably looks pretty good for their engagement stats, assuming they report on such things – 357 replies, 81 RTs, 69 likes, reported on by the Metro as well as yours truly – it probably reached a lot of people. Sure, it might have shown more journalistic integrity to be a little clearer. But it’s good to stimulate debate, right? BUT, I’ve read more than one horror story of young journos being rated not on the quality of their reporting but on the quantity of their click throughs. Google ‘journalism in the age of clickbait’ if you’re interested. There are a lot of think pieces and exposes to be had. In a nutshell, readers don’t click on as much balanced, factual stuff as we do things that make us want to angrily cry ‘DOWN WITH THIS SORT OF THING’. And that is why we end up with more clickbait. In fairness to the Today Programme, if you look down their timeline, they don’t do this often. They’re generally pretty good at using quotation marks to denote quotes. Maybe the person that runs the account genuinely forgot to do so this one time. Maybe they did it deliberately because they were under pressure to get a certain number of folks engaged. Maybe they agree with the comment and threw caution to the wind. I don’t know their story – but what I do know is that it behooves us as readers and writers to try and do better. To consider context and clarity before putting something out in the world, and to question what we are reading rather than taking it as the absolute truth. And if what we’re putting out there is a question like ‘Do women have too many rights?’ we need to be straight up pressing the delete key on that nonsense.